With attention spans losing ground to smart phones, engaging children on vacation can be hard. Ancient temples and art museums just don’t have the same appeal as games and messaging apps for most kids. But with a bit of out of the box creativity, you can awaken their childlike wonder and create lasting memories that they’ll share with their own kids one day. 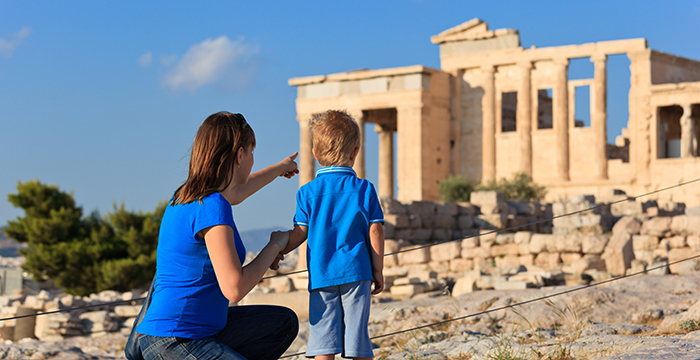 Encourage your kids to learn about where they’ll be visiting before they go. Books and movies set in the place you’re going can garner excitement and spark their imagination when they get there, transforming that ancient ruin or rustic countryside into the backdrop of a familiar story. Try cooking the apropos cuisine beforehand so they get used to the flavors. Croque monsieur and paella won’t intimidate a kid who’s tried them before. Hang 20 key phrases on the fridge so the whole family can practice before you head overseas. If your child is a natural linguist, get a children’s language book and create exercises and games in the weeks leading up to your trip. Pull up a list of attractions online and ask your kids to help round out the itinerary. If they’re animal lovers, look for a zoo or aquarium. If they’re sports fanatics, try to catch a local game. They’ll feel more involved if they have a say in the plans. You can also hunt for activities that fuse what both you and the kids want to do. For example, most museums have children’s programs and some cities even have kid-centric walking tours. When you’re traveling with kids, you’ll need time for playgrounds along with the sights. And since kids usually require more downtime, aim for one or two big activities per day. If you overdo the cultural activities, the kids will likely lose interest. Be flexible when it comes to taking breaks, veering from the plan now and then to do something spontaneous. The kids will learn how to go with the flow and the vacation will feel more like an adventure. Between flights, trains, and waiting in line at attractions, there are tons of chances for kids to get bored or restless as you travel. Bring multiple forms of entertainment, from books and games to tablets and kid-friendly apps on your phone. Let your kids have some dollars, euros, or pesos of their own to spend on souvenirs. It will give them a sense of autonomy while teaching them the basics of budgeting. Traveling is a great time to start a new hobby. Whether it’s writing, collecting coins or hiking, a new experience on vacation can open the door to a lifelong passion. Forget about their regular schedules and daily routines on your trip. Travel can teach kids how to handle extra freedom— like choosing their bedtime or when they want to eat—in a positive way. Photos are obligatory, but you can engage your kids’ left brain even further with handmade mementoes. Encourage them to keep a scrapbook journal with drawings and a record of what they see, do, and eat, as well things like ticket stubs, menus, postcards, and maps. Do you travel with kids often? We’d love to hear what works best for you. Share your tips for traveling with kids in the Facebook comments.